Special Topics In GameologySpecial Topics In Gameology explores a specific corner of the gaming world in a miniseries of articles. In this special end-of-year edition, we’re examining some of our favorite unsung odds and ends from across the games of 2016. Ghostbusters is one of cinema’s greatest love letters to New York City. From its Columbia University dropout heroes to its cranky Brooklynite secretary and the yellow-and-blue license plates of the Ecto-1, the film’s Big Apple setting is as much a part of the movie’s identity as proton packs or Slimer. At the film’s climax, when Gozer The Gozerian arrives to destroy the world in the form of the Stay Puft Marshmallow Man, the boys in gray are, in Egon Spengler’s words, “terrified beyond the capacity for rational thought.” It’s only when the creature stomps on the Holy Trinity Lutheran Church during its rampage that the team is finally forced to take action. “Nobody steps on a church in my town!” is the war cry that snaps the team out of their fear and sends them into battle. As an extra-dimensional harbinger of the apocalypse, Gozer was too terrifying to even consider. As a larger-than-average threat to the local architecture, though? Gozer is toast. Community pride also motivates the world-saving heroes of Shin Megami Tensei: Persona 3. It’s the story of a high school student who transfers to Gekkoukan High in the fictional town of Iwatodai. During the day, the main character is a regular teenager, juggling academics and a social life. After dark, he is a member of the Specialized Extracurricular Execution Squad (SEES), a group committed to eliminating the monstrous Shadows that appear every night during the Dark Hour. Near the end of the game, the squad is told that Nyx The Annihilator is coming to destroy the world and eradicate humanity. They are then given a choice: resist her and attempt to save mankind or have their memories erased and accept death with blissful ignorance. 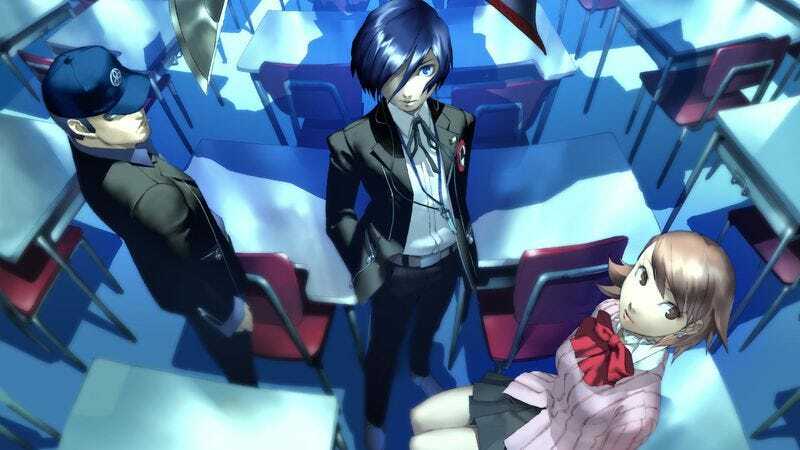 Persona 3 wants players to choose to save the world, and it simplifies the whole world down to a single, relatable town to guide them toward that choice. For the main character and players alike, Iwatodai is an adopted home, and their connection with the town grows over time as it becomes more familiar through day-to-day routine. For the first several in-game days, for example, you can’t visit any of the town’s shops, but as time passes, the retailers start to open their doors. The mom-and-pop shops—running the gamut from used bookstores to antiques—endear themselves not just through sheer neighborhood charm but also their utility. The indie coffee joint brews a mean cup of joe that will boost your charm stat. The jewelry boutique sells baubles that provide special benefits when worn during a fight. The stores upgrade their wares over time, so you’re continually patronizing local businesses and chatting up the staff even if you’re just showing up to nab the latest loot. Because nearly a year passes over the course of Persona 3’s story, players have the opportunity to encounter townsfolk over time and follow their struggles and victories. A boy at the train station spends the entire year trying to play with a stray cat because his mother won’t let him have one of his own. A couple that frequents the movie theater struggles to commit despite their obvious affection for each other. A middle school student complains about her homeroom teacher but gradually comes to understand and appreciate him. Sure, the workaday concerns of the local color sometimes seem quaint compared to SEES’ quest to save humanity from a biblical extinction event, but regularly conversing with the town’s familiar faces personalizes the threat. It’s a vital reminder of what the stakes are in the upcoming final battle: Players who fail to defeat Nyx will be leaving the cat lovers and struggling couples of the world to die. Becoming invested in their personal stories is an important way to stay motivated in the battle against Armageddon. At the same time that it’s nurturing the player’s fondness for Iwatodai, Persona 3 is also encouraging them to feel responsible for it. Throughout the game, victims of a mysterious illness called Apathy Syndrome appear around town brain-dead and uncommunicative. You can cure a month’s worth of victims by defeating a special monster during a full moon. Preventing familiar faces from succumbing to the disease or curing those who have already fallen victim become reasons to continue the fight, and that motivation only grows as the neighbors become more familiar. Seeing the town’s zombified citizens resume their normal schedules or overhearing conversations about lives returning to normal is a powerful source of positive reinforcement and furthers the bond with your community. For the first eight months of the game, defeating shadows and curing the locals becomes routine. After players are told about the coming of Nyx, though, that routine is abandoned. In December and January, there are no boss monsters to defeat during the full moon, so two months’ worth of Apathy Syndrome victims lie around town uncured. Garbage begins to fill the streets, graffiti appears on every surface that paint will stick to, and supporters of a pro-Nyx cult and their propaganda begin to appear on every street corner. Through eight months of routine—patronizing shops, keeping up with the locals, and battling super-powered monsters once a month—players form the sort of bond with Iwatodai that can only come from time and familiarity. They’re empowered enough to protect the town and its people from every threat it has faced so far. But for two months, when the stakes are at their highest, you are suddenly unable to help. Without those scheduled showdowns, the game’s final two months are largely meditative. The members of SEES talk among themselves about their odds against Nyx and whether she can even be defeated. For players, these final months are spent drifting through the corpse of your adopted town without an immediate goal, watching as familiar faces become zombified and local hangouts are vandalized. This is the Marshmallow-Man-stepping-on-a-church moment of Persona 3. The bringer of total human extinction is just too massive a threat to even comprehend, never mind fight. But the overgrown out-of-towner causing the locals to get sick and inspiring cultists to graffiti the neighborhood shrine is a threat that simply has to be dealt with. We don’t have a relationship with the entire world; we have a relationship with Iwatodai. And after spending nearly a year calling it home, we’re prepared to cancel Armageddon just to protect it. Nyx’s arrival threatens every person on Earth, but Persona 3’s borders end at Iwatodai’s city limits. For players, Iwatodai is functionally the entire world, and its citizens are all of humanity. Although fighting Nyx will have global ramifications, the entire game is dedicated to building up our nerve to save the world by getting us invested in the part of it that’s ours. The Ghostbusters weren’t able to defeat Gozer because they were bold warriors or shrewd diplomats. They drew all their authority from the fact that they were “duly elected representatives of the city, county, and state of New York.” The Specialized Extracurricular Execution Squad, in a similar gesture, battle their own destructor wearing their school uniforms, identifying themselves not as saviors of humanity but as defenders of a specific community.